There’s just no keeping media under wraps in the modern age. 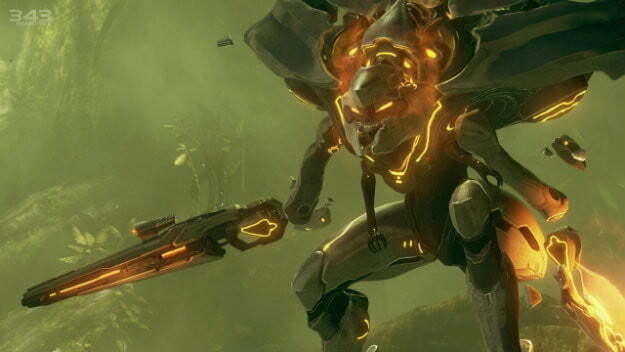 Microsoft and 343 Industries’ Halo 4 is the latest video game to leak onto the Internet well ahead of its November release date. Images of retail discs of the Xbox 360 exclusive appeared online on the web forum NeoGAF on Thursday, as well as images of the game running on an Xbox 360 dashboard. Full video playthroughs of the game began appearing online later on. “There are people putting the whole thing on YouTube,” Halo franchise director Frank O’Connor told Polygon, “Microsoft is addressing that a single case at a time, it just takes a little while to handle.” The leak is thought to have originated at a manufacturing facility. While O’Connor said that the team at 343 Industries is unsurprised by the leak, and undeterred from its in-progress development of downloadable content for the game, like new Spartan Ops episodes, Microsoft is getting more aggressive in its pursuit of Halo 4 pirates. Anyone playing the game on an Xbox 360 connected to the Internet, for example, is receiving a lifetime ban from Xbox Live. These users, according to MCV, are receiving emails to tell them they have been suspended from the service. These users have little recourse as, according to Microsoft’s Xbox Live Code of Conduct, the company reserves the right to suspend new accounts opened by users trying to get around suspensions, provided Microsoft identifies them. This isn’t the first time that Microsoft has sought and permanently banned Xbox Live users. In 2011, Microsoft discovered a number of users that had illegitimately accessed Xbox Live Marketplace items and began issuing bans from the service that would last until the date 12/31/9999. It has also regularly banned cheaters from using the service. It actually isn’t even the first time it’s banned players for playing pirated Halo games. A number of players received permanent Xbox Live bans in 2010 for playing Halo: Reach a month before it was released. With Halo 4 appearing on Torrent sharing websites, will the release of Microsoft’s big holiday game be hampered by lost sales? We’ll know in November.